White House press secretary Sean Spicer—exhibiting behavior typical of a jealous lover or an uptight prep school principal—reportedly arranged a surprise phone check for White House staffers in an effort to crack down on information leaks. According to Politico, Spicer became aware last week that information from a meeting involving about a dozen communications staffers had leaked to the press. I imagine the press secretary then turned very red indeed (except around the eyes). Spicer consulted with White House counsel Don McGahn before conducting the meeting in which government-issued and personal cell phones were checked. In that same meeting, Spicer warned staffers not to use encrypted texting apps like Confide and Signal. Multiple sources in the room then leaked Spicer’s meeting about leaks to Politico. These are the only friends that Spicer’s got left now that he’s alienated most of the press, and they do not seem to like him. 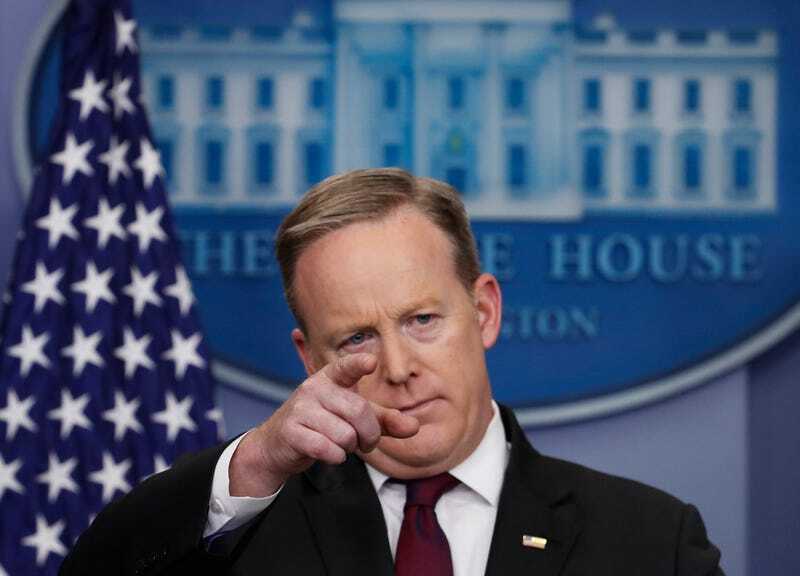 It probably has something to do with the fact that, as Politico reports, Spicer, “has repeatedly berated his aides, launching expletive-filled tirades in which he’s accused them of disclosing sensitive information to reporters and saying that they’ve disappointed him.” Maybe this wasn’t a leak so much as a swirly.